Choosing the best off-grid solar system is not easy as off-grid systems are many times more complicated than grid connected systems. In this article we will highlight some of the many considerations which must be taken into account and discuss the various off-grid system types available. We also explain why a good quality ‘inverter/charger’ is vital to building a reliable off-grid system. Finally we will dive into the different brands available and determine which systems are best suited to different applications. Many people believe an off-grid system can be easily put together (which may be true in the case of a small caravan or cabin) but in reality these systems need to be carefully designed by an experienced solar installer or SAPS system designer. Solar and battery storage systems must be installed by an experienced licensed electrical professional. Modern off-grid solar systems are typically high voltage and can generate and store huge amounts of energy which can result in damage, fire or serious injury if the installation does not meet all relevant regulations, standards & guidelines. Off-grid system can be designed using both AC or DC coupled power generation sources. AC coupled options include common solar inverters, wind turbines of generators. DC coupled sources include solar charge controllers or micro hydro systems. Whether a system is AC or DC coupled is based on the inverter/charger and it’s compatibility with different solar inverters (AC) or solar charge controllers (DC). Many modern multi-mode inverters can be both AC and DC coupled which creates a very secure flexible system. With the above considerations in mind the key component of an off-grid power system is the main battery inverter/charger often referred to as a multi-mode inverter as they can usually operate as either an off-grid or grid-tie system. The inverter/charger is both the heart and brains of a stand-alone power system and manages not only the battery, but energy flow from all other sources such as solar, wind, micro-hydro or a backup generator. The battery inverter/charger’s job is to supply a steady ‘pure sine wave’ or clean AC power and must be able to meet the load requirements of the appliances under all conditions. In addition it must also be able to charge the batteries from sources such as solar, wind or a generator. Many appliances such as water pumps, fridge compressors and air-conditioning units require very high surge (peak) power during startup and the inverter must be able to to cope with this surge. This is where many cheaper inverters can fail. If multiple appliances are running at the same time then the inverter must also be able to supply continuous power under all conditions including higher temperatures, so must be sized correctly to account for temperature derating. Again this is where cheaper (transformerless) inverters can often trip, especially during high summer temperatures. 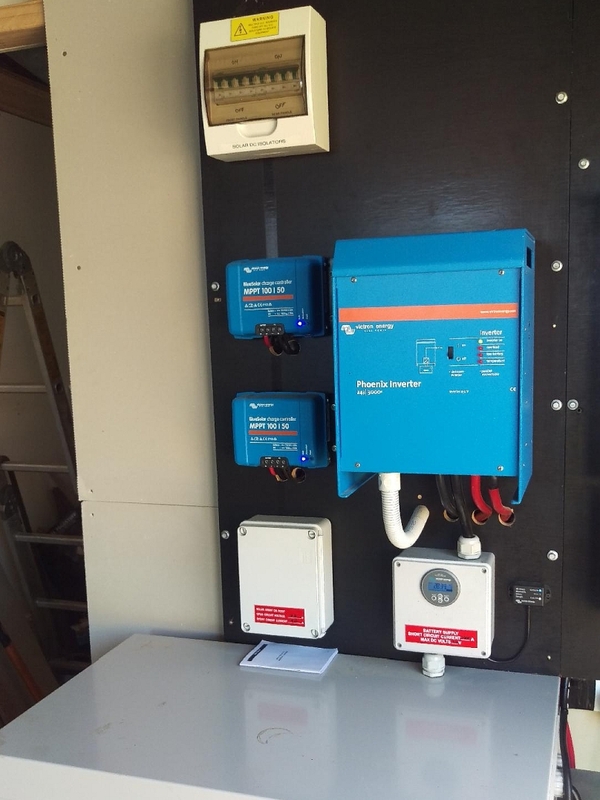 Off-grid solar power system using a SP PRO inverter/charger coupled with a Fronius Primo solar inverter and BYD B-box Pro lithium battery - System designed and installed by Off-grid Energy Australia. Recommended for solar Professionals - Technical guide to selecting and sizing off-grid and energy storage systems. A solar professional should be able to put together what is known as a load table to help determine which type and size inverter is best suited to your individual needs. The load table is also used to size the solar array, battery and backup generator. Safe, very low risk (sealed Gel). More recently lithium battery systems have become extremely popular due to the high efficiency (95 to 98%), compact size, lightweight and scalability. In contrast lead-acid battery banks have a fixed size or capacity whereas lithium modular systems do not suffer this limitation. This flexible sizing allows for additional capacity to be added at a later stage, which is a real bonus for both installers and customers alike. Lithium batteries have a much higher energy density compared to lead-acid and thus are lighter and more compact. 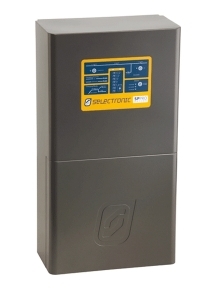 A huge advantage of lithium is the ability to sustain a low state of charge (partial state of charge) for a prolonged amount of time without any negative effects such as sulfation which is a common problem with lead-acid batteries. Can trip off under continuous high loads. Can be difficult to recycle at end of life. May not function without a compatible inverter. Managed lithium - Many lithium battery systems contain a BMS (battery management system) which requires a dedicated communication link to the inverter in order to operate. If the inverter isn’t compatible with the battery then they cannot function together and will not work. A issue with this type of system is that if the communications is disconnect or suffers interference then often the inverter or battery will shutdown to ensure the battery is not damaged. The LG chem RESU 48V batteries are compatible with almost all the leading off-grid inverter brands. The list now includes Selectronic, Schneider Electric and Victron Energy. The BYD B-Box Pro is also compatible with a growing range of hybrid and off-grid inverters including Victron, SMA and Selectronic. Modular lithium LFP battery system from PowerPlus Energy. Non-managed Lithium - There are also ‘non-managed’ lithium battery options available which do not require a fixed communication in order to operate such as Simpliphi PHI and LiFe from Powerplus Energy. These batteries are self-managed with an internal BMS to monitor state of charge, temperature and cell voltages. The big benefit with this type of battery is that they can be used to replace existing lead-acid batteries and do not require any special communications or connections. What’s best for off-grid applications? In my experience non-managed lithium battery options are a more reliable choice for off-grid systems as communications used by managed batteries can be problematic, trip off or become unstable especially at low state of charge. They are also generally more modular and capable of creating much larger capacity battery systems. Modern off-grid solar systems use multi-mode inverters/chargers to manage batteries, solar, and back-up power sources such as a generator. The inverter/charger is the main energy management unit and be can be either AC coupled with solar inverter/s or DC coupled with solar charge controller/s, and in some cases both. Read more about AC and DC coupled systems here. Early off-grid systems used basic battery inverters and were very simple in comparison as the battery charger was a separate unit. These simple inverters generally had low power rating below 2kW and thus were only capable of powering low energy appliances like lights, fans and small pumps. There are many inverters available with different output ratings from as low as 2.4kW up to very large 20kW continuous output. Most of these inverters can supply double or more of the continuous rating for a short amount of time to handle surge power spikes from motors, compressors, pumps etc. This surge rating is critical for off-grid systems to operate under all the various load conditions expected without tripping out or shutting down unexpectedly. This output power rating can also be reduced under higher ambient temperatures. For more detailed information about selecting off-grid and hybrid inverters see our ‘Technical guide to sizing a hybrid inverters and off-grid power systems’. These inverters are all available in a range of different power output ratings (kW) to suit different applications depending on the continuous and peak power requirements. In addition these inverter/chargers can also be both AC or DC coupled using compatible solar inverters or solar charge controllers. When comparing the leading multi-mode inverters specifications and power ratings under all conditions the SP PRO inverters from Selectronic outperform all others with both the highest 30 minute rating and highest peak/surge rating. However it is the advanced energy management software, 63A (15kW) pass through power capability and high charge ratings that put the SP PRO into a league of its own. Premium quality comes at a premium price and the SP PRO inverters are one of the most expensive options available, however considering the generally high cost of off-grid systems, paying a little more a is well worth it for the power and features needed for a reliable off-grid system. The impressive features together with a leading 7 year warranty place the SP PRO at the top of our list. Very powerful and user friendly software package with remote access monitoring. Off-grid system using Selectronic SP PRO inverter/charger coupled with a Fronius solar inverter and 26kWh LiFe lithium battery system from PowerPlus Energy. Installed by Transfer Solar and Harpoon Electrics. Victron Energy based in the Netherlands has grown to become an international high quality manufacture with a wide product range including battery chargers, sinewave inverters, inverters-chargers, DC/DC converters, transfer switches, battery monitors, charge controllers and more. 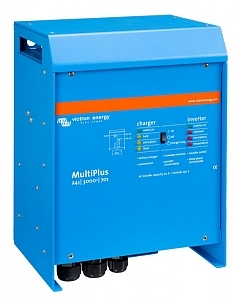 Victron offer the most cost effective range of multi-mode inverters with a huge range of sizes including the new MultiPlus II range of inverters/chargers. For many applications the Victron is a great quality lower cost option especially for DC coupled systems. For smaller off-grid systems the most cost effective combination is Victron inverter/charger and DC coupled solar charge controllers with the BYD B-Box Pro lithium LFP battery system. 24V DC coupled off-grid solar system with 2 x Victron Bluesolar charge controllers, 2.4kW solar array and Victron Phoenix 2.4kW battery inverter. 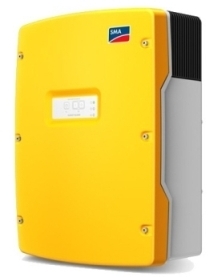 SMA Solar Technology is a leading German solar energy equipment supplier founded in 1981 and is one of the world's largest manufacturer of solar inverters. The well regarded Suny island inverters are a proven performer in harsh outdoor environments in particular sub zero temperatures. Off-grid solar power system using a SMA sunny Island inverter/charger coupled with a Sunny boy solar inverter - System designed and installed by Off-grid Energy Australia. About the Author - Jason Svarc is an accredited off-grid system design specialist who has been designing and building off-grid power systems for over 9 years during which he also taught the off-grid design course at Swinburne University. Having designed, installed and monitored many off-grid systems for many different households over the years he has gained vast experience and knowledge of what is required to build a quality, reliable and high performing off-grid solar power system.